First update in more than two years brings a much-needed feature and interface refresh. When DeskConnect launched in 2013, Apple’s mobile landscape looked very different. Even with the release of iOS 7 just around the corner, file-sharing was still a clunky, complex process, with Airdrop limited to like platforms and iCloud Drive still a year away. 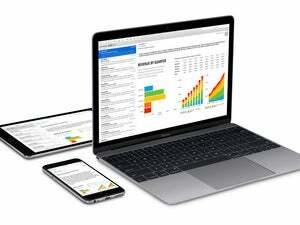 The DeskConnect app might have been a workaround, but it was the kind of solution many were looking for, letting us easily transfer documents and pictures from our Macs to our iPhones without resorting to emails and iMessages. But as AirDrop and iCloud Drive matured, DeskConnect failed to keep up. After a 1.1 update delivered iPad support in late 2013, the app was left to languish as the developers turned their attention to Workflow. But a surprise update has given the free cross-platform file sharer a new lease on life, and its modern features and streamlined interface are worth dusting off the digital dust and dragging it back onto your main home screen. While the new DeskConnect (free on the iTunes Store and on the Mac App Store) update brings support for 3D Touch and the iPad Pro, the core concept hasn’t changed. Once you create a free account, setup is as easy as signing in to the app on any Mac, iPhone, or iPad you have. It’s a straightforward mechanism that’s just as simple as AirDrop. 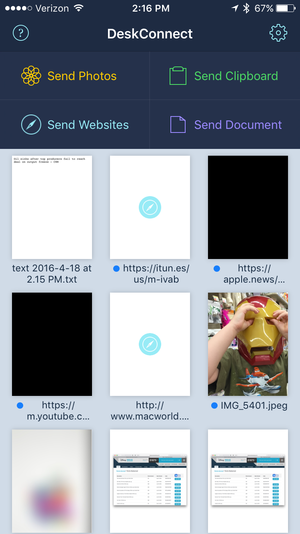 Inside the app there are four send buttons, three of which will deliver the appropriate item (photo, clipboard contents, or document) to one or all of your other devices. For example, tap Send Document and DeskConnect will bring up your favorite cloud storage location (iCloud, Dropbox, Google, etc. ), letting you select which file to send and where to send it. 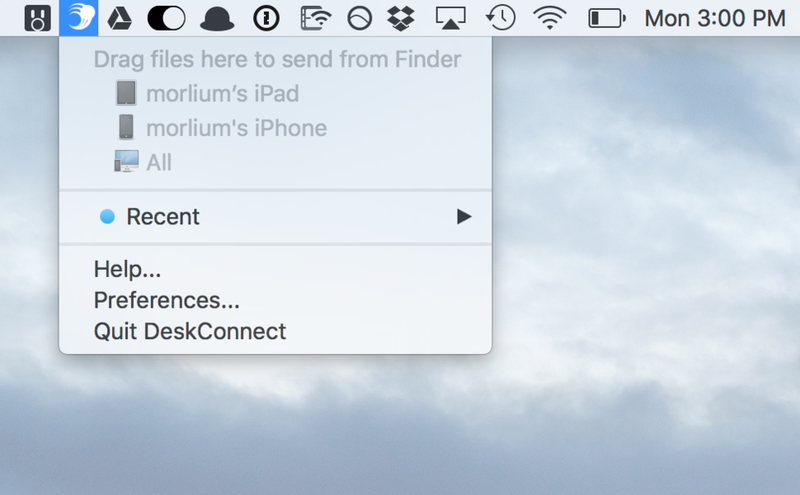 DeskConnect installs as a menu bar item on a Mac. Accomplishing the same task on a Mac, where DeskConnect only exists as a menu bar app, is a little trickier; files need to be dragged up to the icon to be sent, making it more of a receiver than a sender. 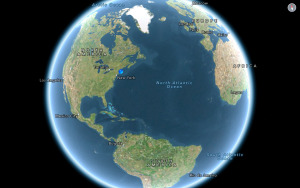 But either method delivers your document nearly instantly, whether you’re inches or miles away from the recipient. Tapping the fourth button, Send Websites, doesn’t actually send a URL. Instead it provides a quick tutorial on the best new feature of DeskConnect: using the sharing extension inside other apps and browsers. Any link you come across can be instantly delivered to any of your other devices by tapping the DeskConnect icon in the share menu. 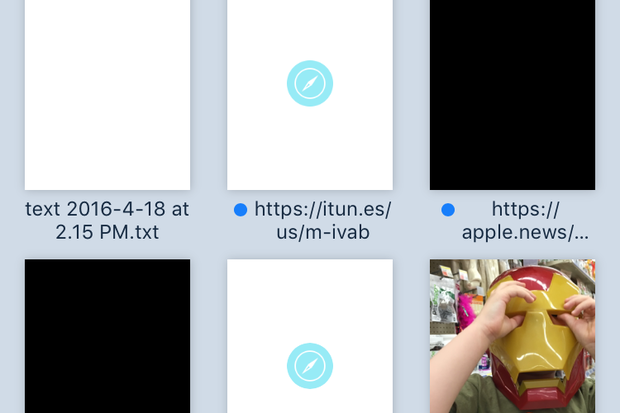 Simple URLs from Safari or Chrome show up as tappable links, but sending from an app like Apple Music or News will add a second time-stamped text file with a brief description. It’s not the most elegant solution (especially since the two files aren’t linked in any way), but it’s still a great way to keep track of URLs that don’t fit in Instapaper or Pocket queues. Files are stored for 30 days and can be retrieved in the space below the send buttons. 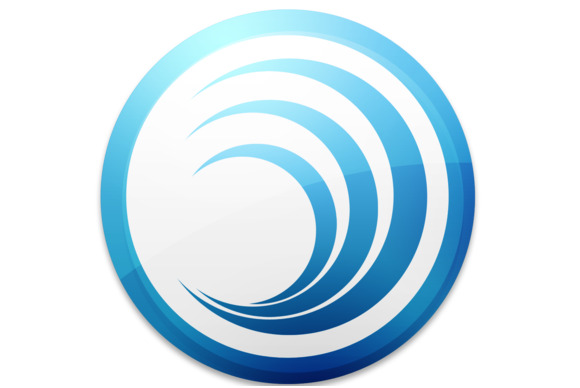 DeskConnect says content is encrypted en route and claims “our servers are under top security, and we have several features in development which will further strengthen the security of our users’ data.” However, since files are short-lived and unlikely to contain much int he way of sensitive data, privacy and security shouldn’t be an issue for most users. But as an AirDrop alternative, DeskConnect shines. While it’s a bit of a bummer that it’s limited to the devices you own and you can’t send files to friends with other DeskConnect accounts, the app is a great, reliable way to transfer files between your devices. And if DeskConnect updates it again before 2018, there’s no telling how good it could get. 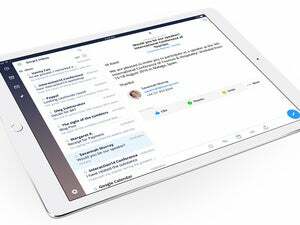 DeskConnect’s first update in more than two years brings a much-needed feature and interface refresh, but its classic ease of use is still its best quality.